Attending a Ticats game is WAY more than just touchdowns and tackles. Your game ticket grants you access to these social spaces and memorable experiences, fun for the entire family! Learn more about the Tiger-Cats game experience below. The official pregame gathering spot for Ticats fans. Enjoy a frosty beverage and a Saltlick sandwich at Canada’s largest outdoor bar, located in the shadow of the Tiger-Cats Touchdown Whistle. Now fully accessible 360° around with a live cover band each game! Your little ones will love to climb, slide and play at Stripes’ Jungle playground. Located in the Findlay Family Zone, Stripes Jungle is also home to Stripes, T.C. and the rest of our mascots. The cost of admission is a high-five! Step outside your comfort zone and treat yourself to something different at Craft Gardens! Taco lovers will flock to La Balsama taco stand and local craft beer aficionados will enjoy Bench Brewing’s hoppy offerings. Come for the football, stay for the country music! Cowboy hats and jean shorts are the norm at Coors Banquet Bar – Tim Hortons Field’s own country and Top 40 bar. Two-step to whatever our live DJ is spinning while you watch the game on one of eight flat screen TV’s. After each and every game, bring the family down to the turf and blow off some steam! Play tag, take photos, soak it all in and enjoy some quality time. Truly one of the coolest and most unique experiences on game day! Picture a sports bar situated in the end zone directly underneath Canada’s largest, outdoor videoboard. You’ll be hard pressed to find a cooler vantage point to take in the game with friends! Looking to build out your Black & Gold wardrobe? The Tiger-Cats Shop flagship store, located at Tim Hortons Field, is your one-stop destination for all things Ticats featuring the latest styles from Adidas, New Era, ’47 Brand, Level Wear and much more! Tim Hortons Field is the new home of the Canadian Football Hall of Fame! Explore over 30,000 artifacts and almost 300 Hall of Fame busts in 10,000 square feet of climate controlled Club Level space. Open to Club Level ticket holders during the game, and everyone with a game ticket, 20 minutes after the final whistle. Tiger-Cats fans can board HSR vehicles free of charge with a valid game ticket! Please note: the King/Hughson shuttle buses will not operate this year. However, the frequency has been increased on the University Plaza shuttle buses which will stop at Main and John on the way to Tim Hortons Field. Tim Hortons Field and its staff are committed to providing a safe, comfortable and enjoyable experience for all guests. It is expected that guests respect and abide by venue rules and regulations at all times. Smoking within the confines of the stadium. Violence, fighting, taunting, threatening remarks and gestures. Throwing objects of any kind. Any behaviour that inhibits another guest’s enjoyment. Smoking is NOT permitted within Tim Hortons Field or on City of Hamilton property. This includes the use of e-cigarettes and vaporizers. 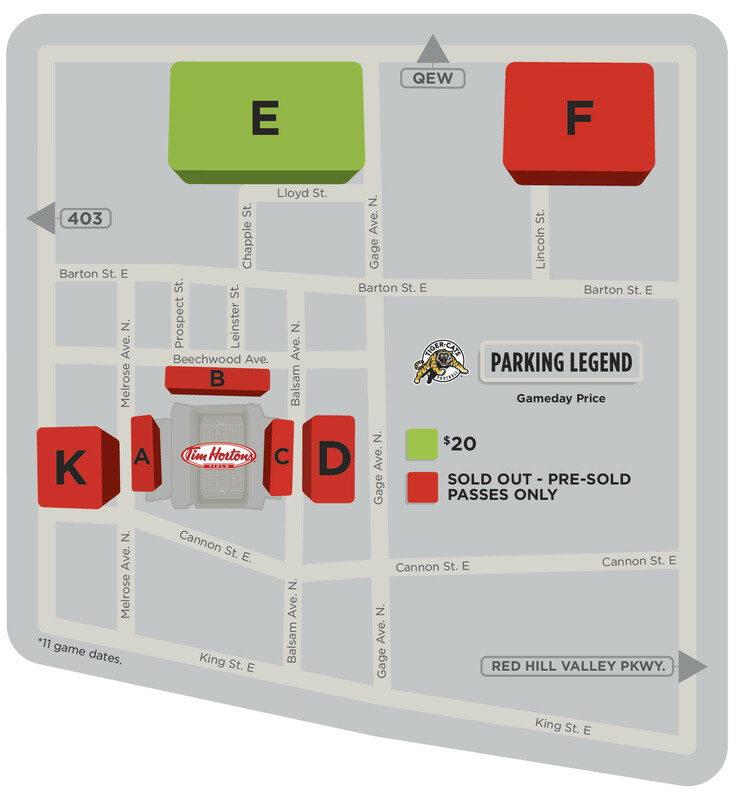 Guests may exit the facility after the 1st quarter through RedTag.ca Gate 4 or Telus Gate 5, which are both located at the north corners of the stadium. Guests must have their ticket for re-entry. Please follow the directions of Police, Security, or any Guest Experience team member and present your ticket when asked. Failure to abide by any rules or regulations is grounds for ejection from the stadium without refund. Tim Hortons Field thanks all of our guests for their cooperation and understanding. For the safety and security of all guests and employees the following items are not permitted inside Tim Hortons Field. As well, all individuals and belongings are subject to be searched. Weapons or replicas of any kind that includes, but is not limited to: guns, firearms, ammunition, stun guns, self-defence sprays, fuels, torches, lighter fluid, bats, brass knuckles, batons, martial art weapons, knives, razor blades, box cutters, scissors and tools. Explosives, aerosols and fireworks of any kind that includes, but is not limited to: flares, smoke bombs, incendiary devices and pyrotechnics. Bags of any kind larger than 14″ x 14″ x 6″ are prohibited. Please note there is no on-site check-in or storage. Illegal drugs, illicit substances or prescription narcotics in non-labelled containers. All tobacco and cannabis related products must be concealed within their package while inside the stadium. Including vaporizers and e-cigarettes. Full size umbrellas with points. Collapsible umbrellas are permitted. Professional camera equipment that includes, but is not limited to: cameras with lenses longer than 3” (detachable or non-detachable), video cameras and the use of video capable devices such as GoPro as well as tripods, selfie sticks, telescopic or similar devices. Items intended to create an optical distraction (laser pointing devices). Aerosol cans or noise making devices, whistles, musical instruments, powered megaphones, air horns. Flag poles/sticks are allowed in the venue IF they do not exceed 4ft in length. Flags and banners exceeding 5ft x 5ft are not permitted unless they are pre-approved by venue staff*. All outside food and beverage**. No coolers, glass/metal bottles, or cans of any kind; thermoses/plastic bottles exceeding 1L are also prohibited (exceptions will be made based on extreme heat conditions). Projectiles including, but not limited to: balls, balloons, frisbees and hula hoops. Seat cushions larger than 15” x 15”. Rollerblades, skateboards, hover boards, scooters, bicycles*** and baby strollers****. Drones (unmanned aircraft systems) or other model aircraft. Inappropriate attire or signage including, but not limited to: profane language, obscene graphics and gang affiliations. Headwear or clothing that may impede the view of other guests. Unapproved pamphlets, handouts and advertisements. Tim Hortons Field staff reserve the sole discretion to deny access for any item(s) deemed disruptive and/or a safety concern. Tim Hortons Field staff also reserve the right to prohibit any additional items deemed dangerous or inappropriate. These items are subject to change at any time. Any guest in possession of any prohibited item(s) will be asked to return the item(s) to their car, check the item(s) at a Guest Services Desk, or dispose of the item(s) in a garbage bin. Guests that refuse to comply may be denied access into or ejected from the stadium and may be subject to arrest. Tim Hortons Field staff reserve the right to handle each occurrence on a case-by-case basis. Possession of any item(s) while inside the stadium which endangers the safety of others, as determined by Tim Hortons Field staff in their reasonable discretion, will, result in immediate ejection from the stadium. Other events such as concerts and other sporting events may have additional prohibited items or a different camera policy. For more information about this and our prohibited items list, *please contact the Guest Experience Department at 905-547-2287 ext. 250. **Guests with medical issues that require special exemptions for outside food and beverage are asked to please contact the Guest Experience Department (905-547-2287 ext. 250 or customerservice@ticats.ca ) at least one week prior to a game or event. ***Strollers or wheelchairs can be stored at any Guest Services location. These items are not permitted in general seating areas. Collapsible strollers that can fit under seats and clear of aisle ways are permitted in the stands. ****Bicycles can be locked on the bike racks outside Pioneer Gate 1. We’ve spent the offseason working on enhancing our rewards card program, and we’re excited to share the details with you! Introducing the 2018 mobile Season Seat Holder All Access card – the newest and easiest way to manage, track and redeem your rewards dollars on game day at Tim Hortons Field and at the Tiger-Cats Shop. Your mobile Season Seat Holder All Access card will feature your rewards dollar balance and provide you with your 15% off concessions and 10% off merchandise discounts. Please note, rewards balance and exclusive discounts only apply to Tiger-Cats home games. 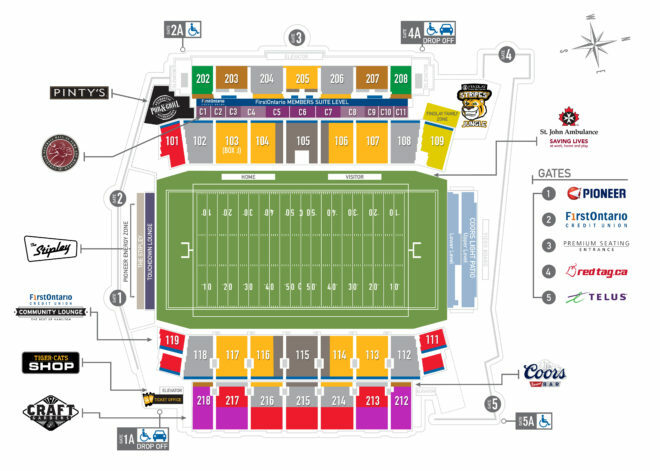 Mobile cards now accepted at popular stadium concession points and fan experience destinations such as: The Tiger-Cats Shop, Coors Banquet Bar, The Stipley, Craft Gardens, Canadian Club Bar, Pinty’s Pub & Grill and select temporary concession stands. Your balance updates instantaneously. No more guessing how many dollars you have left on your card! Please note that your 2018 rewards card balance will expire on December 31, 2018. As the primary account holder you will be in sole possession of the account’s rewards dollar balance. Additional ticket holders on your account can activate mobile cards and pair to their All Access accounts to take advantage of concessions and merchandise discounts. Activate your card with one click – Activation details to follow! To activate your card and receive your rewards dollars, your season tickets balance must be paid in full. A separate email with detailed instructions on how to activate your card will be sent to your inbox in the coming weeks. A Ticats All Access account is also required to activate your card. Don’t have an All Access account yet? Sign up for free at allaccess.ticats.ca. Later this month, we’ll be unveiling a brand new Ticats All Access app. The app will serve as a digital wallet for your mobile rewards card, in addition to content, games and contests. Stay tuned for more details! If you have any questions in the meantime, please do not hesitate to reach out to one of our customer service representatives at 905-547-2287 or rewards@ticats.ca. The Tiger-Cats are thrilled to announce that the team has selected Levy Restaurants, the leader in premium sports and entertainment dining, as the food and hospitality partner for Tim Hortons Field. Partnering with Levy, the team will design a new, best-in-class fan experience, creating unique new dining spaces throughout the stadium, expanding menu options for all fans and bringing a new level of hospitality. Levy Restaurants, founded in Chicago in 1978, is recognized as one of America’s fastest growing and most critically acclaimed restaurant companies, and is the leader in premium sports and entertainment dining. Levy was recently named one of the 10 most innovative companies in sports in the world by Fast Company magazine. The company’s diverse portfolio includes award-winning restaurants such as James Beard Award-winning Spiaggia in Chicago, Fulton’s Crab House, Portobello and Wolfgang Puck Grand Café at Walt Disney World Resort, renowned sports and entertainment venues like Wrigley Field in Chicago, Churchill Downs in Louisville, STAPLES Center in Los Angeles, and American Airlines Arena in Miami, and events including the Super Bowl, World Series, U. S. Open, Kentucky Derby, NHL and NBA All-Star Games and the GRAMMY® Awards. A 50/50 draw is a lottery for which 50% of the ticket revenue generated goes to the winning ticket holder and 50% goes to the benefiting charity. 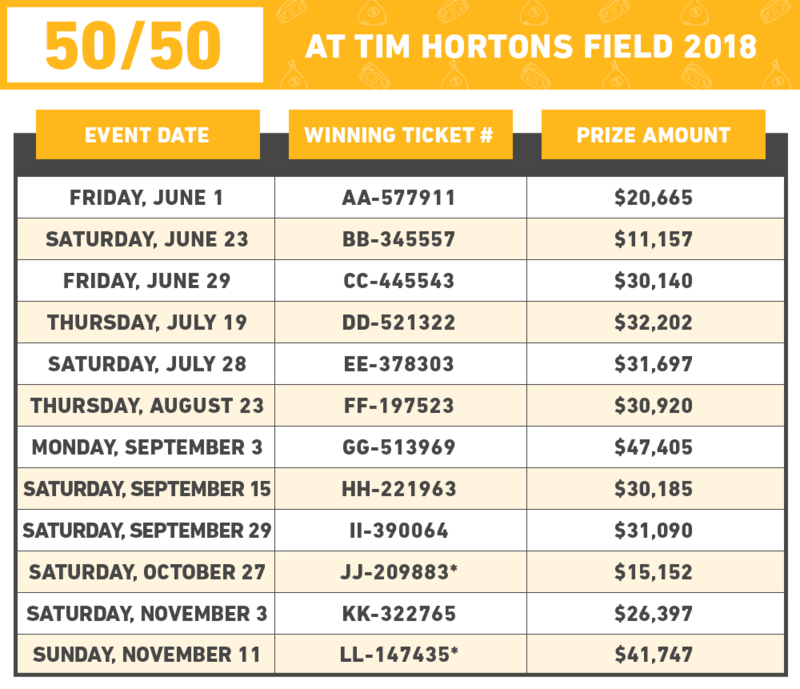 In 2018, The Hamilton Tiger-Cats have again partnered with the Hamilton Bulldogs Foundation to bring electronic 50/50 to Tim Hortons Field. By participating in the 50/50 program, our fans will be helping to raise proceeds to benefit charitable partners throughout Tigertown, including Tim Horton Children’s Foundation, TigerTown PlayAction football teams, Hamilton Bulldogs Foundation and other worthwhile charitable causes. At each event, we will make fans aware of the partner charity of the game. For our 2018 games, ticket pricing will be 3 for $5, 10 for $10 and 60 for $20. For a complete list of Rules and Regulations, click here. Please play responsibly. Problem Gambling Helpline: 1-888-230-3505 or www.problemgamblinghelpline.ca. Click here for a list of winning numbers. If you have the winning number, call 905-547-2287 ext. 231 to claim your prize. The winner will have six (6) months to claim the prize, with proof of the winning ticket.